W.E.ROCK Events in coordination with Hammer King Productions and Side X Side Super Jam, brings a UTV Class race to the 2009 King of the Hammers (KOH) race week. The UTV Class race will be a limited entry, and shortened version of the buggy race. 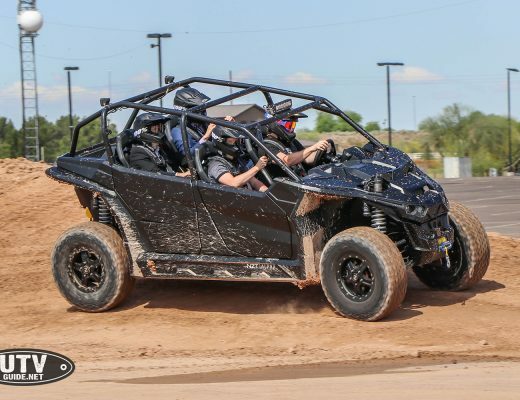 Top UTV racers, UTV media representatives and Rock Crawlers (in UTVs) will race across the rugged terrain of Johnson Valley SVRA, known as the Hammers. The race course will include 2 of the infamous Hammers rock crawling trails and miles of desert sections, which will include lakebeds, whoop sections, gravel and rock washes, and deep sand areas. The KOH UTV race is scheduled for Wednesday, February 25th, 2009; pre-running will start on February 23rd. The main King of the Hammers buggy race will be Friday, February 27th, with a Last Chance Qualifier Thursday, February 26th. The buggy races will include 60 LCQ competitors vying for 10 open positions in the main KOH race which will include 92 start positions. In its 3rd year, the King of the Hammers race has quickly become an off road Halo event, with teams from all disciplines of off road motor-sports. A large spectator turn out for the race week is expected, with many teams bringing support crews and fans from all across the United States. Off road oriented vendors will be filling the main pit area, displaying their newest and greatest products for the racers and spectators alike. While Hammer King Productions is the main promoter for this race week, W.E.ROCK is the official sanctioning body for both Hammer King Productions and Side X Side Super Jam. Side X Side Super Jam is a new UTV event promotion company formed by the founders and current operators of W.E.ROCK Events. UTVGuide.net is partnering with Kawasaki and Roggy Enterprises to field a Teryx in this race.